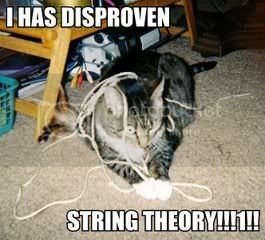 New evidence this week has suggested that Dark Matter is composed of a complex web of superstrings. Not ordinary superstrings – but super chunky, unwashed (hence the dark and dirty colour) double-ply strings. And that’s not all. The web is brittle. Sometimes large lengths of double-ply superstring will break off and wrap themselves into a very tight ball. A recent NASA study suggested that not only could these string balls attain the size of a small asteroid but they would also be subject to the gravitational pull of nearby objects if they formed within a star’s gravitational influence. With Dark Matter five times as plentiful as ordinary matter in the Universe, the study postulates that the chances of Earth being hit by a string-based asteroid is very real. This casts doubt upon our current strategy for dealing with asteroids on a collision course with Earth. Not only is Bruce Willis not as young as he was but the assumption has always been that the asteroid would be composed of rock that could be mined and blown up. A tightly wound ball of superstring might behave in a radically different fashion. Which is where the International Kittens of Mystery come in. Who knows more about unravelling balls of string than a kitten? They have a plan. They have the kittenpower. All they need is the funds to build Wickerbowl Six – their new orbiting space platform. In an uncertain world there is one organisation that stands head and small furry shoulders above the rest. Whenever the planet is in danger – be it from giant balls of wool or bands of renegade squirrels – only one group is guaranteed to answer the call: The International Kittens of Mystery! If you like a laugh and looking at large colour pictures of cute kittens saving the planet, this is the book for you. It’s the book the iPad was designed for – ask Steve Jobs’ cat. The book can be downloaded from here: All proceeds from the book go towards the upkeep of the International Kittens of Mystery orbiting space platform. And it’s not just rogue asteroids they have to deal with. Last week, for example, CERN had an embarrassing problem with their Large Hadron Collider. They found the Higgs boson they’d been searching for only to have it roll under the sofa. Obviously they needed someone small and agile enough to go in after it. Not to mention the dexterity to retrieve a very small object and the patience to wait it out if it decided to hide. Cats have all that in abundance which is why the first call the Head of CERN made was to the International Kittens of Mystery. A team was despatched and the Higgs boson recovered. Amnesty International’s claims that the Higgs boson had been tortured for an hour prior to recovery are, of course, totally unfounded. The teeth and claw marks on the Higgs boson were innocently produced during the complex recovery process and the stomach found at the scene was coincidental. And the first reviews are in! Here’s what Andi Schechter thought about the book.